Venturing out to a new zone always needs an anchor in the form of some known or comfort tool. For me amongst food, Rice is one such anchor or comfort ingredient for me. Pairing any amount of side dishes with one good rice dish works for my family. 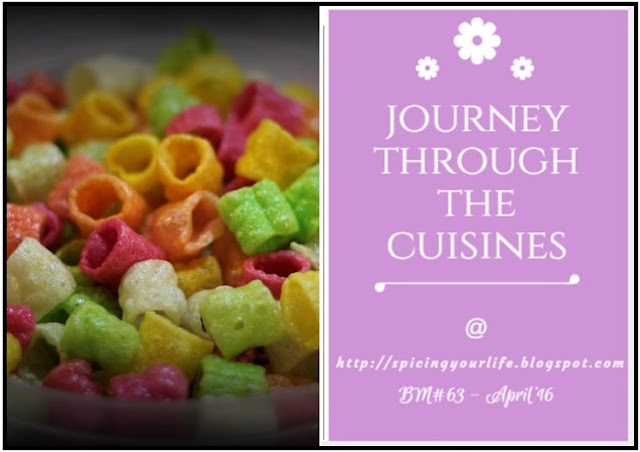 The food in kenya exhibits the influence of India, Middle east and Asian flavors to a large extent. While the origin of Biryani is itself debatable, but back in Kenya this is attributed to the Indian ancestry. It is nothing like the biryani we eat - neither the lucknowi nor the hyderabadi...it is not even layered but there is something about this that makes you associate with the biryani. 4) Next add the chopped tomatoes and saute it for 4-5 min. 5) Add the dry powders, red chilly turmeric, garam masala,black pepper at this stage to aide faster water evaporation. 8) Add the ghee, curd and salt at this stage and let it cook until desired gravy consistency. I prefer it to be thicker. 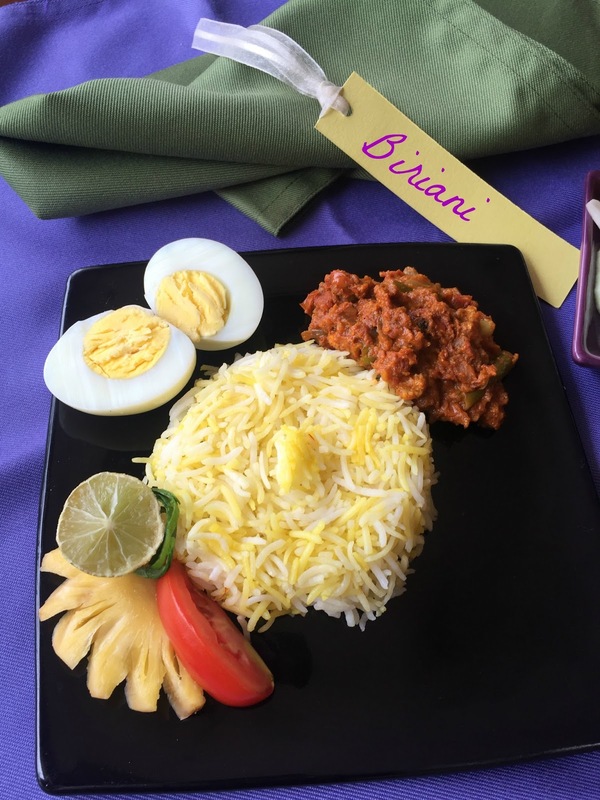 10) Serve the rice with the gravy and garnish with pineapple, tomato, egg and lemon. The rice is simple yet I can see a real long list of ingredients for the gravy, which will make it very flavorful. And I can see you working hard over the presentation, which I must appreciate.kudos. Looks like de-constructed version of our biryani. Love all the side dishes..
haha, after reading the first 3 ingredients on your list, I scrolled up the screen to spot the veggies and paneer in the biryani. Biryani must have tasted great with the gravy and beautiful presentation. What an inviting Biriyani! So similar to our biriyani! I have heard from my father that many of the Kenyan recipes closely resemble our Indian cuisine. Wonderful to see the Kenyan briyani, and your setup rocks Pradnya, prefect plating. Flavourful rice definitely. 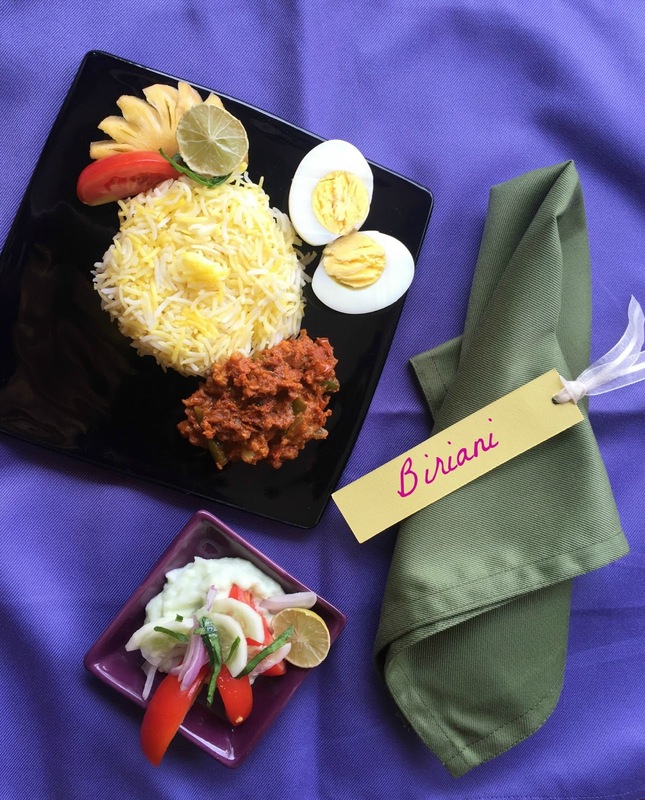 The biriani looks and sound like a deconstructed Biryani from India. Good change from the routine rice dishes commonly made. Looks amazing! Never knew there was a biryani recipe too in Africa though had an idea about the other Indian inspired dishes. Going by your pictures, I first thought there were no veggies involved in this biryani. :) I love how you have cooked it so perfect, each grain standing apart. Rice looks fluffy and I can see all the grains seperated. Love the flavorful gravy.I like your presentation,it looks so neat. The long list of ingredients sure associate themselves to making biryani :-) and to the amazing flavor they impart to the dish. Lovely pick for Letter B.
Wow! Indian sounding names for African dishes!! The list of ingredients look similar to that of our biryani but the look is different for sure. Love the whole setup. Bookmarked the recipe to try it soon. what a unique interpretation of biryani and the plating is gorgeous with the black plate - quite a color contrast. also I am 100% with your sentiments - we are all human!